You are currently browsing articles tagged paris subway. 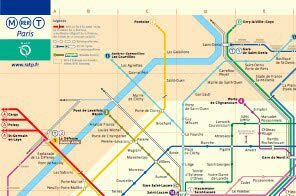 Paris Metro maps, schedules, tickets, passes, helpful travel tips. The Paris Metro consists of 300 stations on 16 lines covering the 10x10km area of central Paris. Metro lines are numbered from 1 to 14 with two “bis” or secondary lines 3b and 7b. Other Metro maps such as individual line maps can be downloaded directly from RATP.fr (in french). 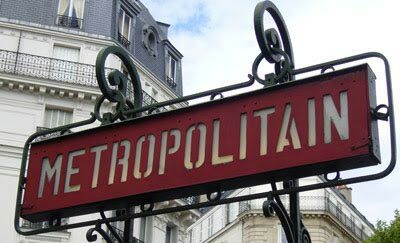 The Paris Metro runs from roughly 05:30 till 00:40 (5:30am – 12:40am) Sunday thru Thursday and 05:30 – 01:40 on Fridays, Saturdays and on days before a holiday. Frequency between most trains range from 2 minutes during rush hour up to 8-10 minutes during off hours, holidays, and sundays. Download a schedule/timetable of first and last Paris Metro trains. Updated January 2013. (Even though this is quite old, the times are roughly unchanged and the RATP has stopped producing this full schedule.) Times are approximate! This includes schedule of first/last Paris RER A (Disneyland) and RER B (airport) trains. 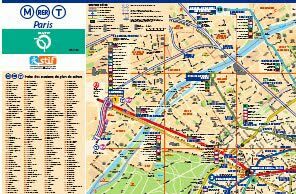 The RATP offers a route planner via their website which can use street addresses, station names or well known locations to create a travel itinerary for you, including necessary connections and total travel time. Route options under “Criteria” can be chosen for fewest connections, least amount of walking and quickest route (the default). There are a wide variety of tickets available including single ride tickets, books of 10 or 20, single day passes, multi-day passes, Monday to Sunday week passes, monthly passes and year passes. 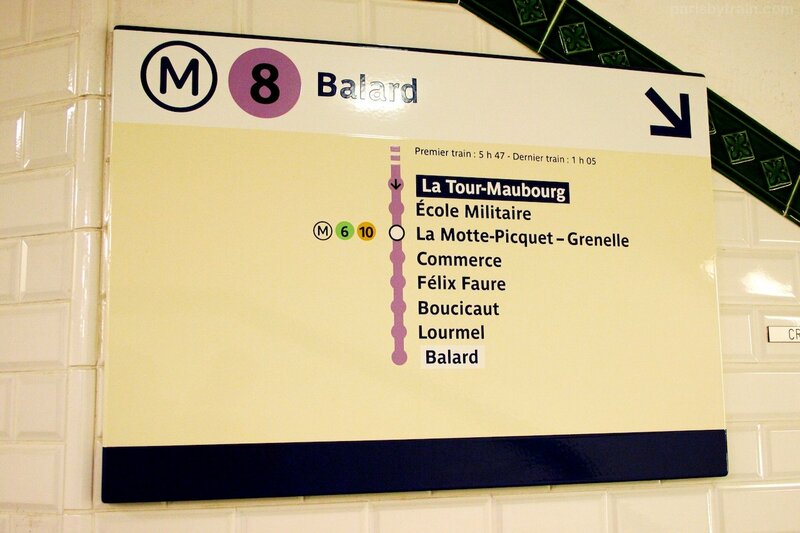 Single tickets for the Metro are known as “Ticket t+”. These tickets are valid for a single continuous journey of any length, throughout the Metro system, including changes to other Metro lines and RER interurban trains within Zone 1. These tickets are sold as single units or in books of 10. Tickets can be purchased from ticket windows inside stations or through automated ticket vending machines accepting Euro coins and smart chip credit cards. The single ticket price is . Books of ten, called a “carnet” [kar-nay], are sold at a discount for ( each, a little under 20% off the regular fare). Children from ages 4 to 9 years old (inclusive) can use reduced fare tickets, which are available only in books of 10, for per book of ten. Children 3 and under ride for free. Keep in mind that non-smart chip credit cards will not work at either the automated ticket machines nor at ticket windows, thus Euro cash or coin would be required. 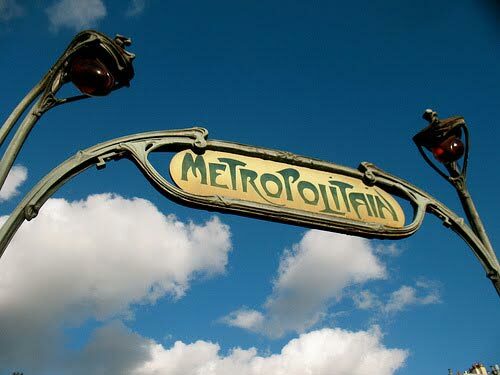 Read more about Paris Metro Tickets and transfers allowed. A day ticket is called the Ticket Mobilis which is good for unlimited rides on the Metro system during operating hours for the day it is used. (Not valid for airports, see note below.) Physically it’s a coupon of about the same size as the Paris Metro Ticket t+. Ticket Mobilis is available in various fare zone coverage from 1-2 zones to 1-5 zones. If you’ll be traveling strictly within central Paris, zones 1 & 2 cover the entire Metro system, and a 1-2 zone Ticket Mobilis is the recommended ticket. Price is . As the Ticket Mobilis can be purchased on one day and used someday in the future you must print the date of use on the ticket before use. To prevent people sharing tickets, first and last names are also required. Note: Ticket Mobilis day pass is not valid for Paris CDG Airport nor Paris Orly Airport except by using Paris airport bus 350 or Paris airport bus 351 for CDG Airport and buses 183 or 285 for Orly Airport. (Non-express city buses, 2-3X travel time.) This means that RER B train, Roissybus, Orlybus, Orlyval train are all not valid for the Mobilis day ticket. The Carte Paris Visite is a multi-use paper ticket coupon (similar to a Ticket Mobilis or Ticket t+). Formerly (prior to 2014) the Paris Visite also came with a black folding card which required the printed name of the bearer and the ticket coupon requires the card number and date of use to be written on in pen, as to avoid ticket sharing between passengers. This is no longer in practice as of mid-2014. You will only receive the white paper Paris Visite ticket itself. Discounts to attractions in and around Paris are included with the Paris Visite card. (See the discounts on Paris Visite.) To take advantage of the discount at the attractions, simply present your Paris Visite ticket during its validity period (which you must mark on the ticket itself using a pen, along with your first & last name). Buy Paris Visite Online – You can buy Paris Visite tickets online for home delivery through the Paris Visitor Bureau website, but I wouldn’t recommend it due to the delivery cost. For USA/Canada/Australia/Japan (anywhere overseas) the cost of delivery is 24€ through DHL Express. In United Kingdom, delivery of Paris Visite is 14,50€. There is one free “delivery” option for buying Paris Visite online – pickup your Paris Visite at the Paris Visitor Bureau. But, I can’t imagine why you’d purchase Paris Visite online to have it delivered to the Paris Visitor Bureau, in Paris, which would require a Metro ride in itself, a trip that would likely take 90 minutes round-trip from your hotel. You could just purchase the Paris Visite at any Metro ticket machine or ticket window, anywhere in Paris, at CDG/Orly airports or at any of the major intercity train stations throughout Paris. Week long tickets are sold in the form of plastic contactless smartcards known as the Pass Navigo Découverte. Zones 1-5 will cover travel to & from Airports Charles de Gaulle (CDG) and Orly (ORY, by Orlybus, not Orlyval train), which are in zones 5 and 4 respectively and Paris-Versailles trains (zone 4). The prices above do not include the 5€ fee for the plastic card itself, non-refundable, unlike the London Oyster card. To purchase the pass Navigo Découverte you will be required to present and attach a face photo measuring 3cm tall x 2.5cm wide to the paper nominative card that comes in addition to the plastic smartcard. Home printing of this photo, black & white or colour, is acceptable. You will be required to print your name on this card as well. After the paper card is completed a self-adhesive clear plastic cover is folded over the face of the card, protecting the picture and name of the holder. The contactless smart card and the paper card must be carried together to be valid for travel. There is some confusion between the Carte Orange and Pass Navigo in terms of week passes. Carte Orange was previously a physical coupon like ticket (much like the Ticket Mobilis) and paper nominative photo card that is now no longer in use. This coupon and paper card has been replaced by the new contactless smart cards known as the Pass Navigo and Pass Navigo Découverte (for non-residents of France). 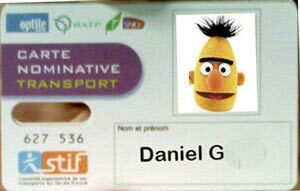 The Paris regional transit authority has phased out the name “Carte Orange” as the name of the weekly or monthly “subscriptions” that you must purchase and “add” to your Pass Navigo or Pass Navigo Découverte. 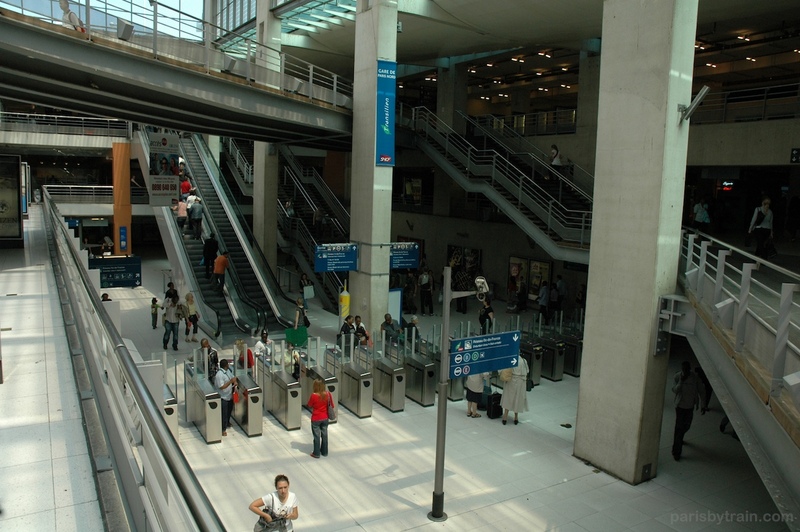 Paris airports are accessible via the RER train system, rather than the Paris Metro. See instructions on the RER B from CDG to Paris, Orly to Paris and Paris Beauvais Airport Train for more information. Most of Paris’ 300 Metro stations are located underground with a handful above ground. Stations are marked with various styles of signs as shown below. Some Metro stations are joined with large train stations (“gare”) serving other types rail transport such as intercity surface trains and RER regional express trains which travel both above and below ground. Some notable large stations within Paris serving all three types of train transport include: Gare St. Lazare, Gare du Nord , Gare de l’Est, Gare de Lyon, Gare d’Austerlitz and Gare Montparnasse. 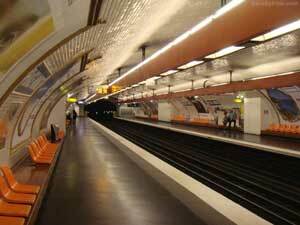 Most stations and Paris Metro lines are not handicap accessible save for a few exceptions . Stations have multiple entrances/exits, up to ten for the largest underground station, Chatelet Les Halles. 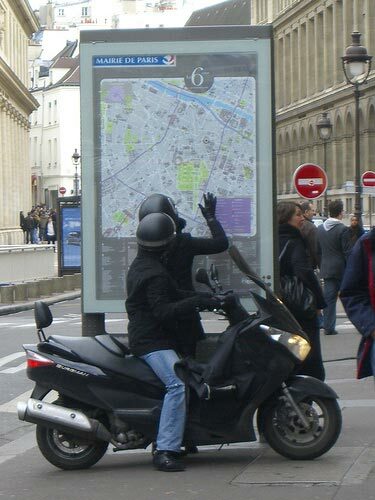 Street maps are posted throughout central Paris providing information on the local district (“arrondissement”). These maps can be useful in locating nearby Metro stations. Within a Metro station, tickets can be purchased from manned ticket windows and from automated ticket vending machines. 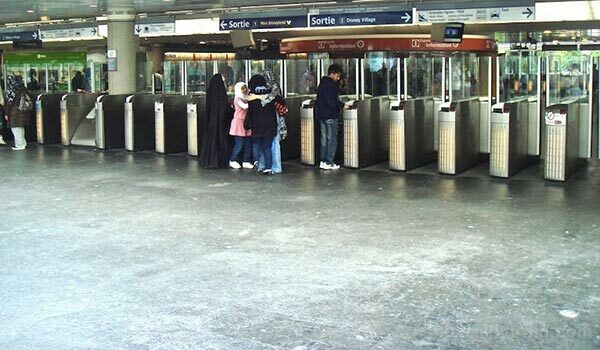 Most passes are only sold from ticket windows although the Ticket Mobilis day ticket is available via the machines. Ticket windows may not be open nor manned at all times thus requiring use of the vending machines. Certain entrances to stations may give direct access to train platforms, which require that you already have your ticket or pass. Ticket vending machines such as the one shown in the photo accept Euro coins (for purchases up to 30€) and smartchip credit cards. Cash notes or bills are not accepted at these machines. 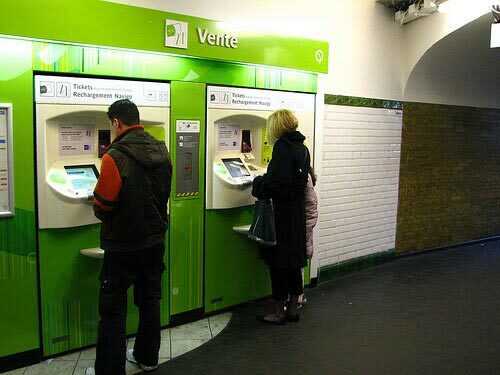 See the guide on using Paris Metro ticket vending machines for more information. Access to Metro train platforms is controlled via turnstiles or gate type barriers which are operated by either magnetic stripe coupon tickets (Ticket t+, Mobilis, etc.) 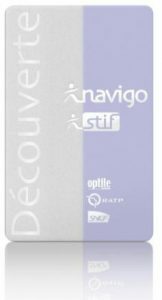 or contactless smart cards such as the Pass Navigo Decouverte. To operate the barrier with a ticket, insert the ticket magnetic stripe side down, into a turnstile that is not marked with a red X or red circle which indicates an exit only turnstile. The ticket slot should be on your right while inserting the ticket (see the photo below). The ticket will be ejected on the top of the turnstile which you must retrieve to unlock the barrier. If the ticket is accepted a short high pitched buzzing sound will be emitted, sometimes along with a message displayed on the turnstile requesting you take your ticket back (“Reprenez votre ticket”). Remove the ticket and walk through the turnstile or approach closely the gate barrier and wait for it to open. Some gates are slow to open, especially side swinging double door gates. If your ticket appears to have been accepted, yet the gate has not swung open, be sure you are sufficiently close to the gates in order to trip the sensor. Be patient and don’t panic. The gate should swing open within 5 seconds maximum. A ticket that is not accepted will cause the turnstile to emit a longer, lower pitched (unpleasant) buzzing noise, sometimes with a message in red indicating your ticket was not valid. See an employee at a ticket window or information booth for help in this case. They will usually open a wheelchair accessible gate for you to pass through. Operating barriers with contactless smart cards works by passing the card over the purple reader zone on the tops of the turnstiles or barriers. The smart cards may take a second or two to be recognized by the transponders, so keep the pass over the reader area until a “ding” sound is emitted for an accepted pass. Keep in mind that passes near expiration will cause the barrier to emit a buzzing noise instead of a ding, along with a message noting the date of expiry. Pass through the turnstile or gate as per normal. Many Metro stations serve multiple lines through several different train platforms within a single station. To find your way to the correct platform in the correct direction requires that you to keep a mindful eye on signs posted throughout the pedestrian tunnels. At each subterranean intersection you will see Metro line numbers and possibly station names which are used to denote direction of travel. Direction of travel is always denoted by the terminus station, the last station or stop on the line, rather than magnetic pole directions such as north, south, east, west. 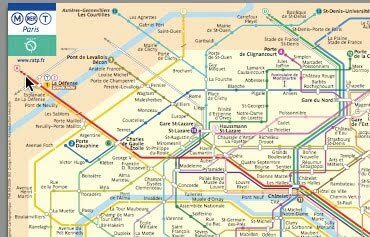 To understand whether the line is going in the direction you wish to travel, you should refer a Paris Metro map, which are posted near station entrances and on all train platforms. Nearly all train platforms have overhead signs showing the time remaining till the next two trains arrive at the station, denoted in minutes. These signs are also a way to verify that you’re on the correct line, heading in the correct direction. 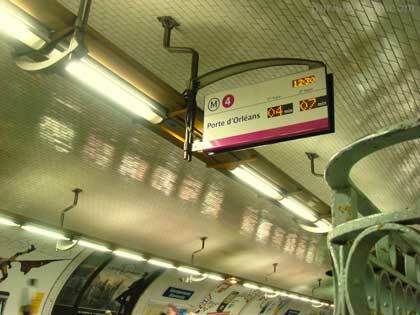 The photo below shows Metro Line 4 in direction of Porte d’Orleans with 4 minutes remaining till the next train arrives. On the opposite side of this platform will be another sign of exact same color and number, but the direction will be marked as Porte de Clignancourt, the opposite direction. Keep in mind that the train arrival times posted on these signs are only estimates and are not always accurate. Due to traffic congestion and rider issues minutes may be added or subtracted at any moment. On rare occasion, but worth mentioning, some Metro line platforms are accessed by traversing another platform for a different line. This means you’ll arrive at a platform and think the current platform is the correct one, but in reality, your desired line is further along. Pay special attention to the overhead signs and the system maps posted on the platform walls to ensure you’re on the correct platform. Details on opening train car doors, etiquette on boarding, exiting, seating and more, to help you ride the Metro like a Parisien. Children 4-9, cost is . Discounted individual children tickets no longer available. Children 3 and under ride for free. 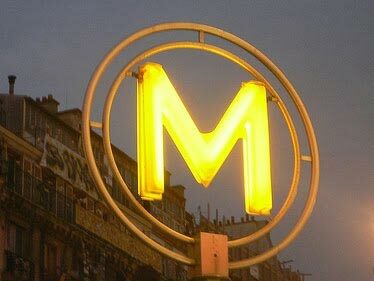 The Parisian subway is known as the Metro, short for “chemin de fer Métropolitain” [metropolitan railway]. The network of underground rail lines has 245 stations scattered throughout central Paris’ 20 “arrondissements” [districts]. Tickets for the Paris Metro are purchased from blue or green “billetteries” [ticket vending machines] or from “guichets” [manned ticket windows] within stations. The current price () for a single ticket known as a “Ticket t+” is . Tickets can also be purchased as a book of ten or twenty, known as a “carnet” [booklet], for a slight discount (booklet of ten Ticket t+ is or each). During your journey, keep your ticket with you until you arrive at your destination station and pass through the exit gates or turnstiles. “Controleurs” [ticket inspectors] may stop you at any point during your journey to ask to see a valid ticket or pass. Failure to provide a valid fare will result in a fine of €35, payable on the spot through credit card. Paris Metro stations are mostly located underground with a few above ground due to local geography. Entry into the Metro stations is free up until the turnstiles which mark the area from which you must have a valid transportation ticket or pass. Some station entrances are unmanned, having no ticket window nor ticket vending machines, only turnstiles which accept tickets and smart card passes (Pass Navigo) for entry. Metro lines are numbered from 1 to 14, each a different color, with two “bis” [b or secondary] lines making 16 in total. Each Metro line has two (or more) terminus stations. These end-of-line stations are used to note the direction the train is traveling. Each Metro line platform within a station will be marked with the line number and the direction the trains will travel from that platform. Signs within Paris Metro stations mark the way to train platforms on a given line, in a given direction. Metro lines are signified by the letter M within a circle.There are several Metro stations that serve multiple lines in various directions. This causes some stations to have several vertical levels accessible sometimes only by stairs, but often with escalators and sometimes with elevators for extremely deep stations. As you make you way toward the line platforms within a station, stairs often descend or ascend onto the either side of the rails. Each stairwell is often marked with a detailed Metro line sign showing number, direction, and stations that will be visited as the train travels toward the terminus. Exits from Metro stations are marked by blue “sortie” [exit] signs and often note the street or area they give access to. Stations often have several exits leading out to various streets and pathways. There is often a map provided within the station, outside of the ticketed turnstile area, but still within the station, showing all exits in relation to above ground streets and establishments.